Bronx native Kiara Ramirez is studying childhood education at Nyack College. Although she has a passion for learning and teaching now, school didn’t always come easily to her. 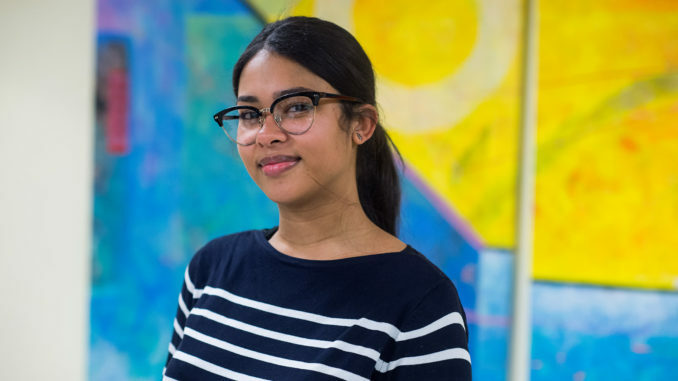 She spoke to us about her former struggles as a student and how the Nyack College community has helped her gain confidence and pursue academic excellence. What brought you to Nyack College and how has being a Nyack student affected you? I’m a transfer student. I went to college in Queens before this, but I was very miserable there. And ever since I’ve come here, I’m literally not the same person that I was before. Before I came to this school, I was so miserable. I was so stuck. Now that I’m in this school, so many doors have opened for me. I’ve met great professors that have recommended me to be a substitute teacher in private schools, which helped me gain experience. Since I was given the opportunity to teach, I learned that this is what I want to do. If it weren’t for Nyack College, I wouldn’t have known that. I tell myself all the time, if I had known about this school when I graduated high school, I would’ve come straight here. But you know, I feel like it was all a part of God’s plan. I feel like I’m continuing to grow and grow here. Everybody’s so friendly. I’ve made so many friends. I just really love it here. How has being at Nyack College changed you? Spiritually. I was raised in church my whole entire life, but I always struggled a lot because I was around bad influences in high school. My friends weren’t Christian, so they would always make fun of me. I wanted to fit in, and I wanted to be popular. I guess that kind of backtracked me. At Nyack College, the professors pray before class begins and they do weekly devotionals and chapel. I have friends here that, if they know that I’m going through something or they know I have a job interview, they’ll stop and pray for me. That’s something you won’t find in secular schools or in CUNY schools. Attending Nyack College has also helped me professionally. I just got a job in admissions, and they’re teaching me how to send emails, how to speak professionally, and how to dress. That is all really helping me grow as a person. I’ve met people with so much wisdom too. I latch onto that. It’s really helped me in the way I think. I always used to be so negative. I’d give up easily. But being here, hearing so much from other people, “You can do it; you can do it.” I started telling myself, “You can do; you can do it,” and thinking of myself how they think of me. That has really, really helped me change and grow a lot. What are some of the words that come to mind when you think of Nyack College? Well, the first thing I think about is God, since it’s such a God-centric community. But I also think of love, because there’s so much love in the atmosphere and the environment. I’ve never felt out of place or like I don’t fit in here. Comfortable, love, and God-centric. Those are the three words that come to my head when I think of Nyack College. What are some of the best parts of being a student at Nyack College? Being comfortable. I’m an introvert. I like my corner. This school has taught me how to open up. Since everybody is so friendly to me, how can I not open up to like people? How can I not be friendly to others when they’re so friendly to me? What are some of the things you’ve learnt from your fellow Nyack College students? A lot of positivity. I have low self-esteem. So, if I’m presented with a challenge, I automatically think I can’t do it—I’m going to fail. Being surrounded by so many people that tell me, “You can do it,” it’s just becomes a part of me. I start telling myself the same thing that they tell me. Have there been any experiences you’ve had at Nyack College that have inspired you or really excited you in thinking about what you want to do when you leave here? Yes, there was. I forget the preacher’s name, but he preached last semester at the first chapel. He preached about following your heart and not worrying about what you see in others. Because sometimes you see other people doing so well, and you’re not, so you start feeling insecure. You think, “Look at what God is doing for that person. What about me?” I’m the kind of person that would always think like that. He preached about that and said to turn to your leaders—turn to your pastors. He encouraged us to look for advice and positivity. That really had an impact on me.